Every other Friday Whole Foods will have a special on something whether it’s blueberries or roast, but last Friday it was salmon. It was $7.99 versus the regular $14.99 so I had to take advantage, especially since I’ve been wanting some lately anyway so this was perfect! Anyway, my sweet neighbor has been telling me about her favorite salmon and parchment paper recipe for literally years now so thought it was time to try it. I was looking for a new way to cook salmon, especially because this salmon was sockeye and it tends to be more dry when I cook it. Anyway, it turned out amazingly well! It was so moist and so yummy! Thanks Drennen for this recipe! Pull out a large piece of parchment paper (big enough that you’ll be able to wrap it around the fish tightly. Put the paper in a baking dish and put the fish on top. Cut a lemon and squeeze all of the juice from the lemon. Then add olive oil, chopped asparagus, scallions, salt and peper. Now place the lemon halves on top of the fish. Fold over the parchment paper so you can seal it up (the steaming effect is what makes this so moist). Cook for 400 for 20 minutes and enjoy! Next time, I think I’m going to add gluten free Tamari soy sauce to it, or even just some fresh cilantro or basil. 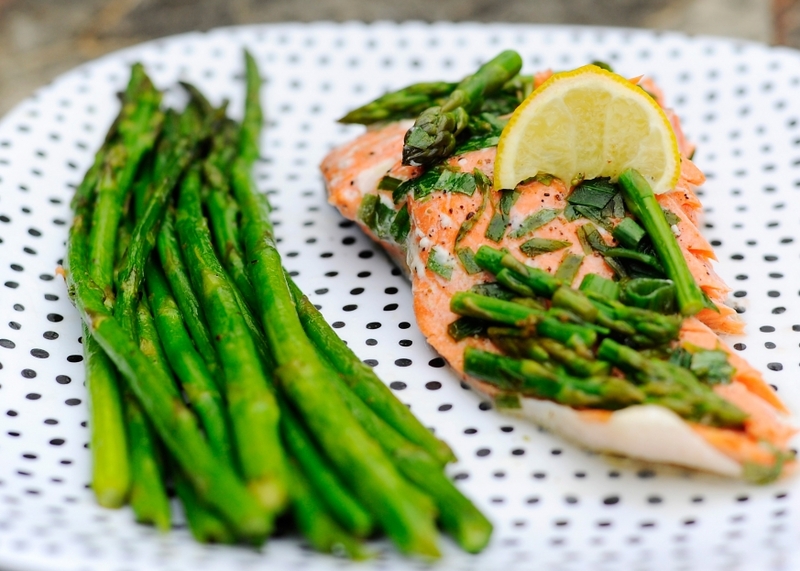 There are so many ways to make this, I’m just excited to know how to make my fish so moist! Oh, and I know I said this before, but the thought of left over fish kind of grosses me out, but I promise, this was even better the next day for lunch! Drennen - I do love this dish! I like to cook sweet potatoes along with this meal as a side – clean them, poke them, rub a little olive oil around them and place them on a cookie sheet lined with parchment paper. Roast in top of oven for 45-50 minutes or until done. 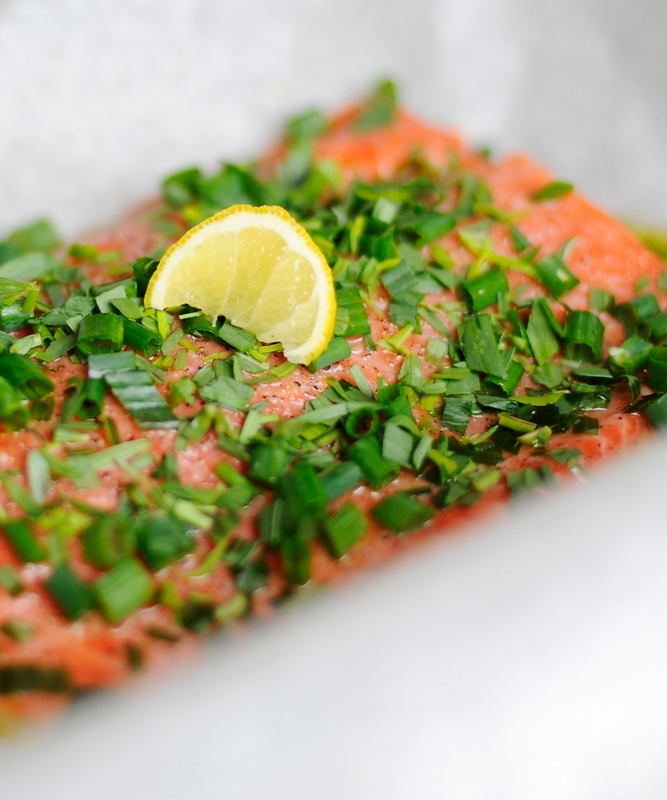 While the potatoes are cooking, you can prepare your salmon. 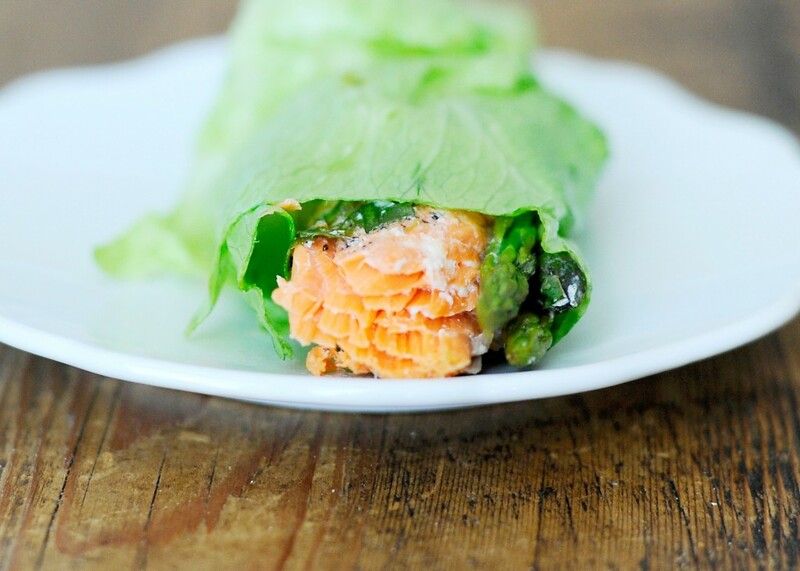 I like to top the salmon with the asparagus (cut into 1″ pieces) along with the chopped scallions. Drizzle with olive oil and season with salt and pepper or some Beau Monde Seasoning or Nature’s Seasoning. I like to squeeze an entire lemon on each fillet and then top each fillet with a lemon half. This makes it good and juicy. Place each pouch on a cookie sheet.